Like many of us, some of you may have very fond memories of sitting for hours on end, setting up the perfect Scalextric track and then trying to keep your little car on it at impossible speeds. Well, in bid to bring roads into the future, eRoadArlanda have now supersized the Scalextric concept to create the world’s first electrified road. Throughout this new age of electric and hybrid cars, there has always been an argument that the range of electric cars is too little and the charging time too high. Whilst battery technology may have come on leaps-and-bounds as of late, there are still those that are hesitant in making the swap to electric power due to ‘range anxiety’. What if you could remove this anxiety, however, by having a road that continually charged or maintained the battery level of your vehicle? In one of several projects that are working towards the Swedish Government’s target of being entirely fossil-fuel free (in terms of cars/trucks/buses/etc) by 2030, that’s exactly what eRoadArlanda’s new road aims to do. It works in pretty much the same way that your Scalextric used to; a small rail runs down the middle of the lane and transfers electric energy to an adjustable arm that is attached to the vehicles driving on it. As long as the vehicle is above the electric rail, the arm will automatically move into the lowered position to make contact. Now, to prevent the rail from wasting electricity or electrocuting pedestrians and animals that happen to cross the road, individual sections of the rail only draw power from the power grid when a vehicle is above it. eRoadArlanda say that splitting the rail into individual sections also allows them to be fair when calculating a vehicle’s energy consumption and subsequently the electricity cost that should be debited to each user. Having already proven that the concept works at a test track, eRoadArlanda have just completed their first implementation of this technology on a public road; installing two kilometres of electric rail along public road 893 between the Arlanda Cargo Terminal and the Rosersberg logistics area. As a starting point, the new road will be used primarily by electric trucks that have been developed as part of the project and aim to negate the need for large batteries in future electric truck design. Providing that the new road is successful, eRoadArlanda are hoping to roll out their new electrified rails on over 20,000km (12,427 miles) of road at a cost of $1.2million per kilometre. Despite the large initial cost, eRoadArlanda say that (assuming electric cars with small batteries cost the same as internal combustion cars) it would take Sweden less than three years to pay for the electrification of its roads. 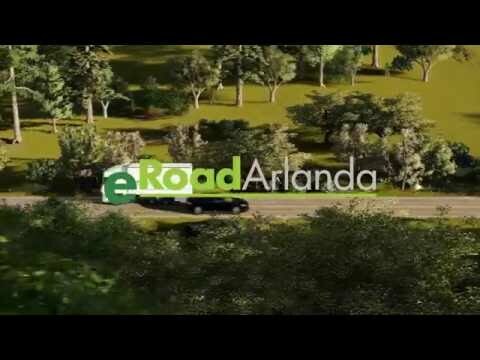 What do you think of eRoadArlanda’s new electric road technology? Do you think it’s the future when it comes to a sustainable electric car infrastructure? We’d like to read your thoughts on Facebook, Twitter or Linkedin.